I know that sugar is bad for me, but sometimes it is so hard to resist the temptation. Especially when I have dried cranberries and white chocolate chips at home. I was not planning on buying any more but needed to get rid of the ones I had. My husband's upcoming birthday and Boss's Day were my perfect excuses to bake, and I made mouthwatering Oatmeal Cranberry White Chocolate Chip cookies. Moreover, we have an unannounced competition at work called "Become an Awesome Baker like Laura Borsick," who spoils us with her yummy creations by sending them with her husband who works with us. As you see, these cookies were meant to be! Soak cranberries in hot water for about 20 minutes. I put them in a bowl, boiled some water in a kettle (you can also microwave some water in a mug for about a minute) and poured it over the cranberries. Meanwhile, using an electric mixer, beat softened butter (or margarine) and brown sugar together in a medium mixing bowl until light and fluffy. Add eggs and olive oil, mixing well. Stir in dried cranberries and white chocolate chips. Drop by rounded teaspoonfuls onto ungreased cookie sheets. Bake for 10-12 minutes or until golden brown. I baked them for about 16 minutes because they did not look done to me at 12 minutes, but I think it will vary depending on your oven. Cool on wire rack. Makes approximately 2 dozen cookies (I used two cookie sheets). *If you are sending them in the mail like I did for my husband's birthday, add a piece of bread to keep the cookies moist. What a gorgeous view! God created these beautiful mountains for people to enjoy and to live in peace among them. But no, we are never satisfied with what we have. We always want more. Sometimes it leads to progress, but sometimes it leads to war. War is terrible. I have never experienced it first hand like my husband or my friend from Croatia did. They experienced different wars and to different degrees, but I consider myself blessed I have not. Majority of the Americans have never experienced it, thanks to the boys who are fighting on the enemy's territory. I am happy that the war is far away from us, but I am not happy that my husband is the one fighting it far away from me. Soviet Union was there, too, and it did not end well. Even though I had been just born at the end of the Soviet-Afghan war, I did get to see the aftermath of it. Wounded warriors begging for money on the streets, with broken lives, no one caring for them, not even the Government for who they had fought. The movie "9th Company" is based on real events from that war and is available for streaming on netflix, if anyone is interested in seeing just a piece of that war. Warning: the movie is tragic and very difficult to watch without tears. Almost every Russian is full of hatred towards this country. My great-great grandfathers disappeared in the battles of the World War II, and I surely did not expect that my life would be again affected by war after I moved to the United States. Only this time, it is in a more real, personal way. I do not have to fight directly or participate in the battles with the enemy, but I have my own battles here, back home. Every day I have to fight tears and a feeling of pity towards myself. A lot of my friends are taken care of by their husbands, but I come home to an empty apartment. I sit at the dinner table alone, and I go to a cold bed alone. I need to be strong to take care of myself and to be safe, so that my husband will not worry about me and will concentrate on his job. I did not get married to take care of myself! But this is my calling at the moment. If I were not able to handle it, the Lord would not have put me through this. My husband's job is to protect us and to make sure we can drive to work, come home, eat our pizzas, and watch TV safely. My job is to wait here and to miss him. He will return to where people think of him. I know he will come back to me because I always wait for him. That is my calling, and I pray I will be strong to fulfill it. How can you not love and wait for such a wonderful man? - Got awakened by a neighbor above stomping across the room to the bathroom AND heard him use it at 5:40 am?! - Yay! I still have 30 more minutes to sleep! - Got up at 6:20 am, feeling like I didn't get enough sleep (remember, the neighbor woke me up)? - Awesome! The new day is here! And I get to wear my favorite business clothes and drink my creamy milkshake for breakfast on the way to work. - Hit traffic on I-65? - That is fine; today I get to enjoy my beautiful new Honda a little longer. - Worked late? - A perfect opportunity to spend more time with my co-workers, to learn from them, and to grow professionally. - Drove home after dark? - Sweet! No traffic, cruise control, and I enjoyed the warm wind through the open window and some loud music. - Cold at home? Like, 69 degrees cold... - I can enjoy the hot shower longer! Thanks to a fixed monthly pay without actual measurement of my water usage. And even though my husband wasn't home to comfort, feed, and warm me up, we got to talk and to see each other on Skype. I am very, very blessed! 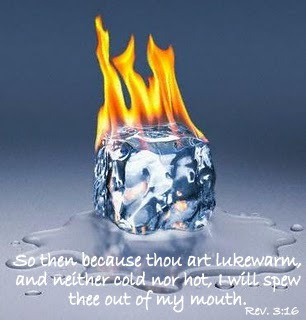 Are You Hot or Just Lukewarm? How does the word "lukewarm" make you feel? What things come to your mind? Lukewarm coffee? Nasty. Lukewarm water in your shower? Terrible! Lukewarm attitude to something? You are probably not too interested in it. On Sunday, our pastor preached on Christians being lukewarm in their faith. In Revelation 3:15-16, Jesus tells to the people of the Laodicea church, "15 I know your works: you are neither cold nor hot. Would that you were either cold or hot! 16 So, because you are lukewarm, and neither hot nor cold, I will spit you out of my mouth." Quite graphic, but He gets the point across: being lukewarm in faith is not pleasing to Him. God should be first in every Christian's life. A lot of Christians go to church only 50-60% of the time, and they feel that it is enough. What if they went to work only 60% of the time? Would they still be working there? How about your kids missing 40% of school? Would they still be in school? They would fail, and that would be unacceptable. Yet, failing to attend church seems to be okay. The same goes about general, unspecific prayers, not confessing your faith in public, and not reading Scriptures. As long as we go to church once in a while, listen to the preacher, and bow down in a silent prayer, we are good to go. When I started thinking about it a little further, I realized how being lukewarm with family and at work can also be disastrous. Imagine this: I do not kiss my husband, we do not have dinner together, and I do not take care of myself (which means, my husband is deployed! Just kidding.) How would it affect our relationship? I do cook for him, I clean the house, and I go out with him to see our friends. Is going through the motions enough? When I am not passionate about our marriage anymore, my lukewarm attitude slowly poisons our love. However, if Christ is in the center of our marriage, we share unconditional love and make effort to express our love to each other even when we do not feel like it. What about work? Are you dreading Mondays and cannot wait for Fridays to come? How does it feel to live only on weekends? Are you growing professionally and enjoying your job? A lot of people hate their jobs, but they do not do anything about it because of either fear to lose income, laziness, or unwillingness to change. You are spending majority of your time at work, so you might as well enjoy it! Being lukewarm at your job means wasting time, degrading, and aging quicker. Not good. However, being passionate about what you do brings joy to your life. We were all made for a purpose, and when you are not loving your job, it should be a good sign that you are in a wrong place. Making change is difficult, but it is worth it. So, the key to a wonderful life is being "hot," or passionate, about God, family, and work. Bad times are definitely stressful, but keeping focus on what is important will help you to go through anything. I strongly believe it, and that is what keeps me going day in and day out, while my beloved husband is far, far away.